. 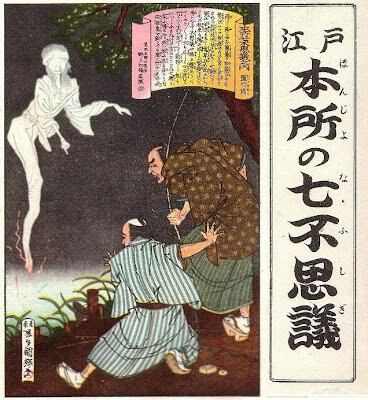 yōkai 妖怪 Yokai - Japanese monsters . Here in our mountains it is cool anyway, but walking at night beside the family graves, at full moon, you might get some inspiration ! 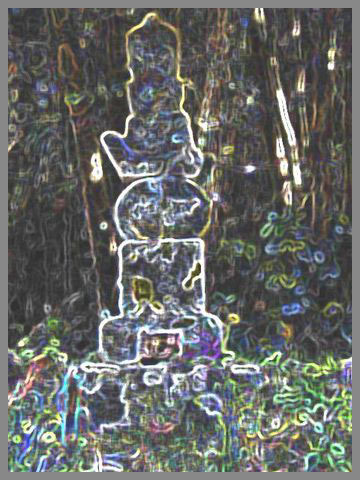 ..... Oni Mai 鬼舞（おにまい）"Demon's Dance"
Gruesome ghost stories were told to keep cool on a hot summer night. In the Northern parts of Europe, where the summers are much cooler, ghost stories are often told in the long winter nights to entertain the children.
. WKD : Honjo Nana Fushigi 本所七不思議 - Seven Wonders of Honjo . Take your time to read them leisurely. The Hungry Ghosts are part of the Six Realms of Existence, rokudoo　六道　of the Buddhist religion. O-Bake, お化け, Literally means, "transforming thing." Anything that is fearful or super-large or otherwise out of the normal range is called O-Bake. On Overview of them all ! 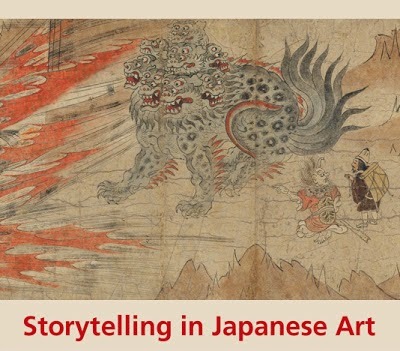 Exhibition Storytelling in Japanese Art. In 2002, The Metropolitan Museum of Art acquired a rare masterwork of Japanese art—A Long Tale for an Autumn Night, a set of three illustrated handscrolls, each more than ten meters long, dating from the medieval period. This major acquisition gave rise to the exhibition "Storytelling in Japanese Art," organized by Masako Watanabe, Senior Research Associate in the Department of Asian Art. Together with this publication, the exhibition traces the rich history of Japanese painted narratives with examples in a range of formats, including illustrated books, folding screens, hanging scrolls, and even playing cards. These objects, which date from the twelfth to the nineteenth century, vividly capture the life and spirit of their time. The popularity of Japanese comics, or manga, and the preeminence of the graphic arts in contemporary Japan attest to the enduring legacy of these traditions. Central to any exploration of this subject is the illustrated handscroll, or emaki, a narrative format that has been essential not only to the dissemination of Japanese tales but also to the very ways in which they are crafted. The more than twenty handscrolls on view in the exhibition, a selection of which are reproduced in arresting detail in these pages, invite viewers to explore myriad subjects that have preoccupied the Japanese imagination for centuries—Buddhist and Shinto miracle tales; the adventures of legendary heroes and their feats at times of war; animals and fantastical creatures that cavort within the human realm; and the ghoulish antics of ghosts and monsters. The exhibition brings together outstanding works from public and private collections both local and from farther afield. We are especially indebted to the New York Public Library for their loan of more than ten precious medieval handscrolls from the Spencer Collection. Joined by a selected of objects from the Metropolitan Museum's own rich holdings in Japanese art, they offer a rare opportunity for visitors of all ages to experience the pleasures and intellectual challenges inherent in Japanese narrative painting. 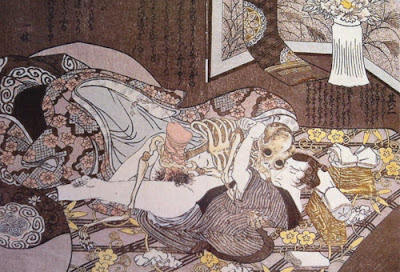 Welcome to the endlessly fascinating world of Japanese storytelling. Japan has a long and rich history of pairing narrative texts with elaborate illustrations—a tradition that continues to this day with manga and other popular forms of animation. Featuring more than sixty works of art in a range of mediums and formats, this exhibition invites you to explore myriad subjects that have preoccupied the Japanese imagination for centuries—Buddhist and Shinto miracle tales; the romantic adventures of legendary heroes and their feats at times of war; animals and fantastical creatures that cavort within the human realm; and the ghoulish antics of ghosts and monsters. From illustrated books and folding screens to textiles and even playing cards, the objects on view, which date from the twelfth to the nineteenth century, vividly capture the life and spirit of their time. Central to our exploration of this subject is the illustrated handscroll, or emaki, a narrative format that is essential not only to the dissemination of Japanese tales but also to the very ways in which they are crafted. The more than twenty handscrolls on view in the galleries demonstrate the many ways in which the pictorial space of the emaki is designed to draw viewers directly into a story, offering a rare opportunity for visitors of all ages to experience the pleasures and intellectual challenges inherent in Japanese narrative painting. 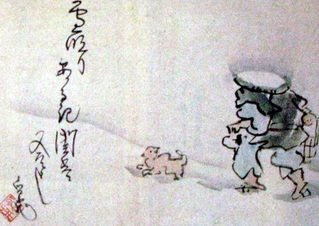 Japanese storytelling reached its apogee during the Nanbokuchō and Muromachi periods (1336–1573). The more than four hundred tales that emerged during the Muromachi period are known collectively as otogi zōshi. 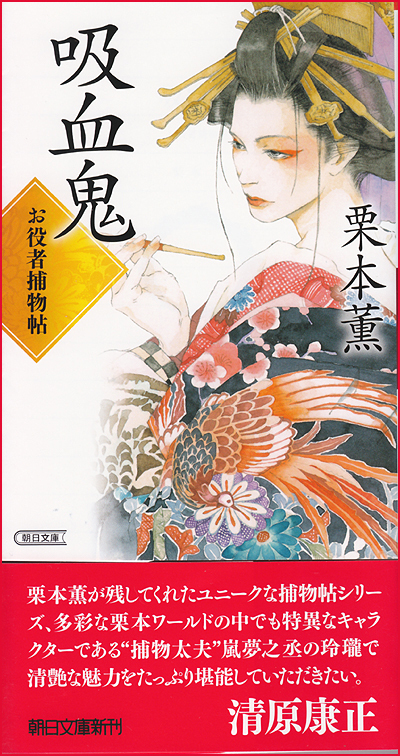 Ranging widely in theme, from religious parables to capricious fables, these short, often didactic stories are a world apart from the courtly romantic tales of the Heian period (794–1185), the heyday of aristocratic society. Many of the plots stem from the epics of the Kamakura period (1185–1333), a time of marked military ascendancy and the rise of a powerful warrior class. Contributing significantly to the development and dissemination of otogi zōshi was the handscroll, a major vehicle for painting and writing throughout East Asia. Illustrated handscrolls, or emaki (picture scrolls), first emerged in Japan in the eighth century. They generally measure about one foot high and can extend for more than thirty feet. Emaki are meant to be unrolled laterally, from right to left, and read in sequential segments of about two feet each. Usually, text sections are interspersed with images, with the narrative preceding the related illustration. A scroll is unrolled with the left hand, while the right hand rolls the part already viewed, allowing the story to emerge from the left and disappear to the right. With the freedom to move through the scenes at his or her own pace, the viewer physically experiences the progression of time and space as the past is rolled away, the present is slowly uncovered, and the future waits to be seen. An eight-headed, nine-tailed monster greeted us at the door of the exhibition. Fortunately for us, the monster was preoccupied with other business, for he guards the gate to hell. Vampires have been introduced by the Europeans, in the 19th century. the name of the vampire is “Kyuketsu-ki,” which means blood-sucking Oni. 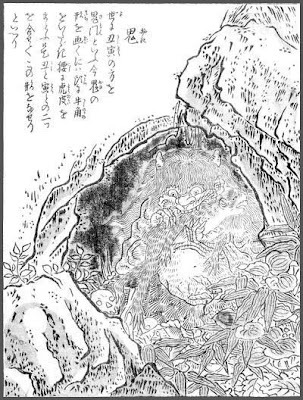 in the late 18th century, the ukiyo-e artist Sekien Toriyama drew a picture in which the Oni is eating an animal with a skull lying at the feet in a cave. The text describes the Oni's relationship to a tiger and cow, a fang and a horn. 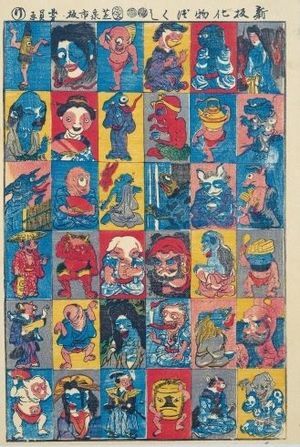 (The revolution of Japanese ghosts in the Edo period).
. Toriyama Sekien 鳥山石燕 (1712 – 1788) . The setting of this story is based in Koyasan where the local Buddhist priest was telling the story of Botan Doro (The Peony Lantern). People had been waiting ages because they knew that he could tell ghost stories with passion and the setting was very mysterious. 。。。。。 Ogiwara Shinnojo was a samurai warrior but his heart was full of woe because he was a widower. At night he felt so alone and memories of the past came back to haunt him and it appeared that he would never feel the fluttering heart of love again. lost on the way . . .
Are these two from our world? or are they from the other world? It is O-Bon and all is possible. Discussion of this haiku and a famous sweet to go with it! (Nagano: Shinano Mainichi Shimbunsha, 1976-79, 6.171). Momonguwa (momonga 鼯鼠) is another word for the Japanese flying squirrel (musasabi); more generally it refers to a wide-eyed, mouth-open boogieman who frightens children; see Kogo dai jiten (Shogakukan 1983) 1642. Shinji Ogawa suggests that "ghost" is a good translation in context, noting that "the association of a willow tree and a ghost was well established by the time of Issa." The haiku captures a moment of energy and imagination, taking its adult readers back to an earlier time when all the world seemed magical. A constant theme in Issa's poetry about children seems to be: Live that way again! Shinji Ogawa paraphrases, "The people may see the field of pampas grass as ghosts." ***** . Saijiki of Buddhist Events .
. Inoue Enryoo 井上 円了 Inoue Enryo .
. - yookai, yōkai 妖怪 Yokai - Japanese monsters - . About 60 hanging scrolls from the Edo and Meiji periods depicting Japanese ghosts were shown to the public at Kinshoji Temple in Minamisoma, Fukushima Prefecture, on Saturday. The exhibition was held on the last day of "bon" summer holidays, which is said to be the day for sending off the spirits of the dead. Most of the artworks were made between the end of Edo period and the mid-Meiji period. One is a hanging scroll painted by Maruyama Oukyo, a famous painter from Edo period, the temple said. The temple's late head priest, who believed that ghosts in the paintings also carry spirits, began collecting the hanging scrolls about 30 years ago. He also began to exhibit the temple's collection to the public and let visitors to pray for the souls of the dead each year, the temple said. Knowing that the temple takes good care of the ghost scrolls, many people donated their own paintings, swelling the temple's collection to 60, it said. "Ghost paintings usually end up in temples, but it is huge to have a collection of 60," said Nobuo Tsuji, 76, an art history expert. ghost stories in US America is a year round endeavor, and the genre is a very significant part of USA literary history, both Poe and Washington Irving having written really famous ghost stories, as have many major USA writers since. Ghost Busters, Casper, etc. I read it as seasonal, too. Summer, school vacation in the US. Toriyama Sekien (鳥山 石燕, 1712 – 1788) was an 18th century scholar and ukiyo-e artist of Japanese folklore. He was the teacher of Utamaro and, before taking up printmaking, a painter of the Kano school. 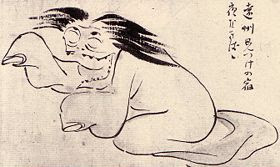 Toriyama is most famous for his attempt to catalogue all species of yōkai in the Hyakki Yakō series. Japan Society Obake Family Day on November 2! Since its release in July 2013, the video game Yōkai Watch has rapidly risen to megahit status in Japan. The game’s characters now star in their own animated program, as well as adorning everything from snack packages to trains. Level-5, the company that produces the game, has taken great care in engineering its blockbuster for surefire success, borrowing winning ideas from a number of other franchises. The breakout popularity of the game has prompted daring comparisons to Japanese superstar Pokémon, with some even saying it has the potential to surpass its predecessor. Japanese folklore abounds with bizarre creatures collectively referred to as the yokai ― the ancestors of the monsters populating Japanese film, literature, manga, and anime. Artist Toriyama Sekien (1712–88) was the first to compile illustrated encyclopedias detailing the appearances and habits of these creepy-crawlies from myth and folklore. Ever since their debut over two centuries ago, the encyclopedias have inspired generations of Japanese artists. Japandemonium Illustrated represents the very first time they have ever been available in English. the 1784 Hyakki Tsurezure Bukuro (An Idle Horde of Things). The collection is complemented by a detailed introduction and helpful annotations for modern-day readers.